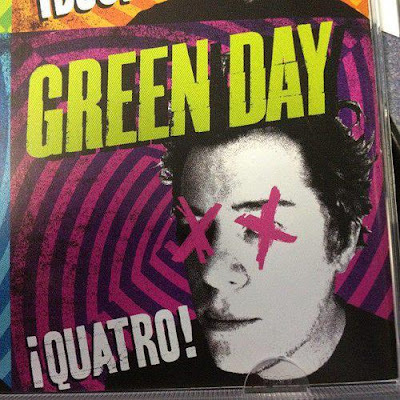 Green Day screened their new documentary, “¡Cuatro!”, at the X Games in Aspen over the weekend. Bassist Mike Dirnt and drummer Tre Cool were on hand for the premiere at Aspen's Wheeler Opera House as part of the X Games Film showcase, and took part for a post-screening Q&A to take audience questions. “¡Cuatro!” goes behind the making of the band’s new album trilogy, “¡Uno!,” “¡Dos!” and “¡Tré!” The film pulls back the curtain and takes fans inside the world of Green Day, from the various spontaneous live performances in select cities across the U.S. to the chronicling of their creative process while conceptualizing and recording their current trilogy. Green Day return to the road in 2013 for a 2-week series of North American shows that start March 28 in Chicago. VIDEO: Green Day preview ¡Dos!